Google is letting you get a little work done while socializing online with a new feature that integrates Google Docs into Hangouts, the popular video chat feature available on Google+, the search giant's social network. The new Hangouts feature lets you add an existing document to your Google Docs list or upload a new document from your desktop. You can also switch between multiple documents, and Google says you can collaborate on multiple documents at once, all while using Google+ video chat. Google Docs in Hangouts was originally launched in September as an experimental feature, but is now available by default to all users. To get started, login to Google+ and click the "Start a Hangout" located at the top of the right-hand column next to your Google+ stream. In the next window that pops up press the green "Hang out" button located below the test webcam image. Once the Hangout has started, to access Google Docs just press the "Docs" button on the upper-right side of the screen located alongside other Hangouts features such as screen sharing and YouTube. 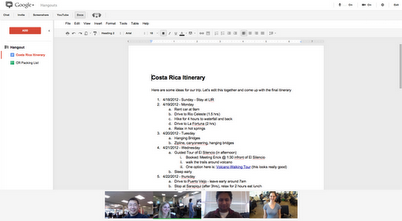 Your Google Docs list will appear in the main part of the screen and your video chat partners will appear below. You can choose multiple documents to get started on by clicking the check boxes next to your documents. A list of all the documents your Hangout is working on will appear in the left-hand side of the Hangout window to quickly switch between documents. You can also press the "Add" button to go back to create or add more documents. In addition to trying out Google Docs, you can also experiment with shared sketchpads and notes from inside the new Google Docs integration.